Think Burrus Blog: Too early for fieldwork in February? Are we experiencing a 2012 - Is it deja vu? Too early for fieldwork in February? Are we experiencing a 2012 - Is it deja vu? The weather has been dry and the temperatures have been unseasonably warm! In the last week, many in central and southern Illinois have started to get the "planting itch." Some have tried to fight this overwhelming farm feeling that has come over them by what is referred to as "petting their tractors." Many have been washing their equipment or getting their planter ready to go because investing time in your planter pays off! It seems strange, but we don't usually worry about the soil being too dry. In recent years, there has been worry about it being too wet and soil compaction, because of high soil moisture, so I suppose working ground could be done at this time; however could you be losing even more existing moisture? I have also seen many applying anhydrous ammonia. This is fine, if you remember to apply a labeled nitrogen inhibitor because we want to keep that nitrogen for the crop! 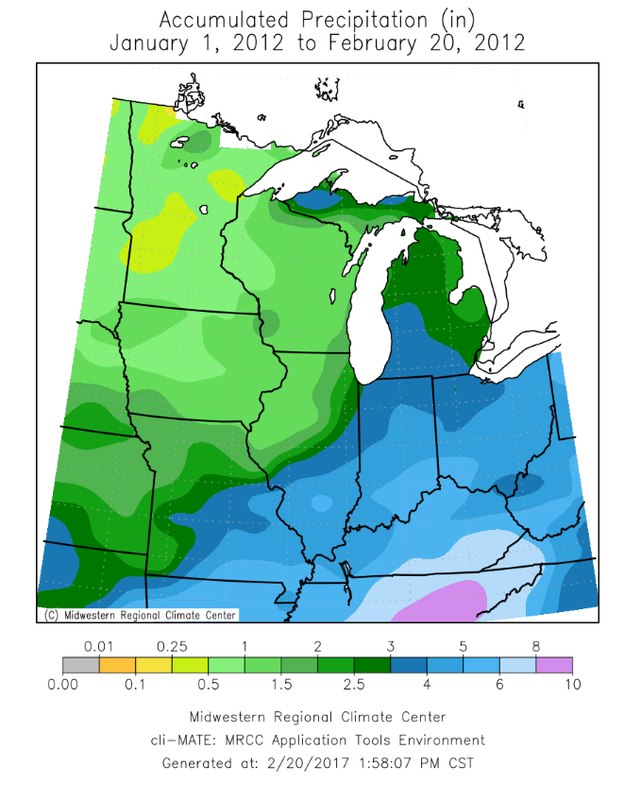 As of yesterday, the high soil temperatures in southern Illinois were approaching 60F! 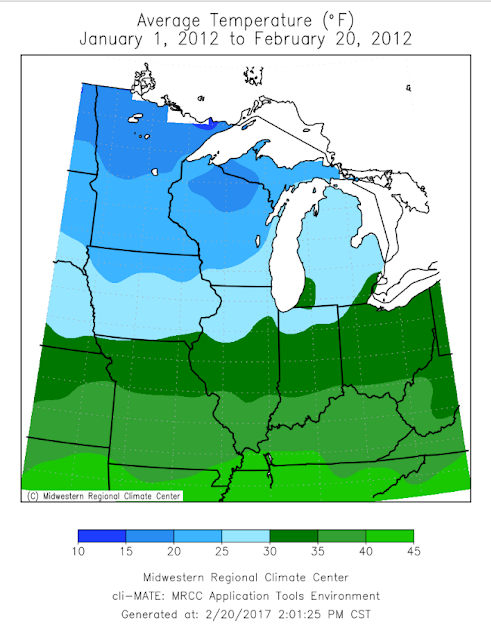 With these high temperatures, some are discouraging anhydrous ammonia applications even with a nitrogen inhibitor! Is it too early to plant? I am for sure that it is too early to plant! Even though mild temperatures remain in the extended forecast, we never know what type of weather Mother Nature may bring. It may feel like March or April, but keep reminding yourself that it is only February! Cold spells could be just around the corner! I am also concerned about it being too dry to plant in some parts of the Midwest. The perfect planting moisture would be close to field capacity. This is the amount of water a soil can hold before draining and there is both air and water available within the soil pores. We normally worry about there being too much soil moisture after corn germination, because this can deprive the developing seedling of oxygen. However, we also need moisture, because without it, the seed is unable to have the moisture it needs to imbibe water during germination and this can also cause a reduction in stand. Without adequate soil moisture or with uneven soil moisture, we could see uneven emergence, which could equate to yield losses up to 8-10%. It is too early to predict, but if it continues to remain dry, some may need to make adjustments to increase seeding depth. Lastly, the buzz is that 2017 has started to feel just like 2012. Is it deja vu all over again? 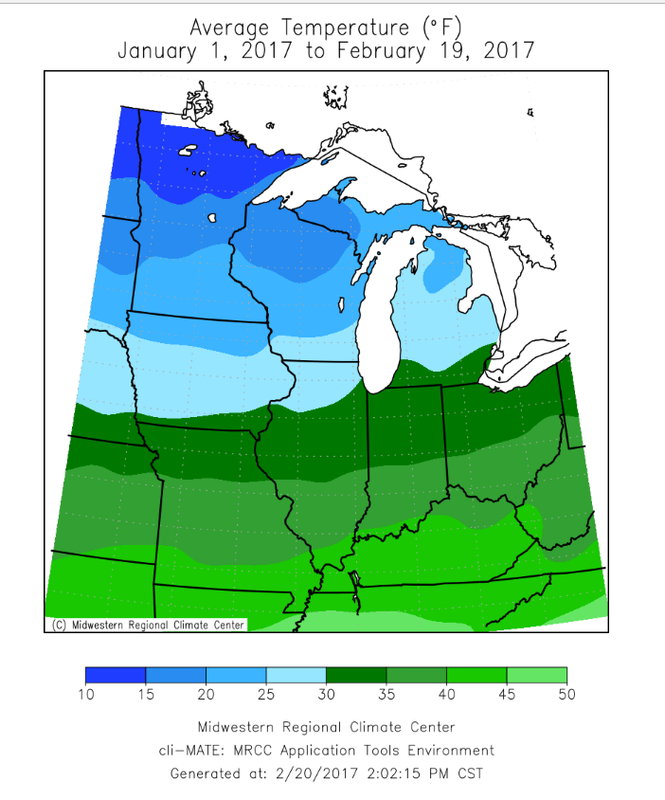 Well, thanks to the Midwest Regional Climate Center and cli-MATE: MRCC Application tools envrironment, I was able to create some maps (below) comparing the average temperatures and precipitation of January and February of 2012 to that of 2017. 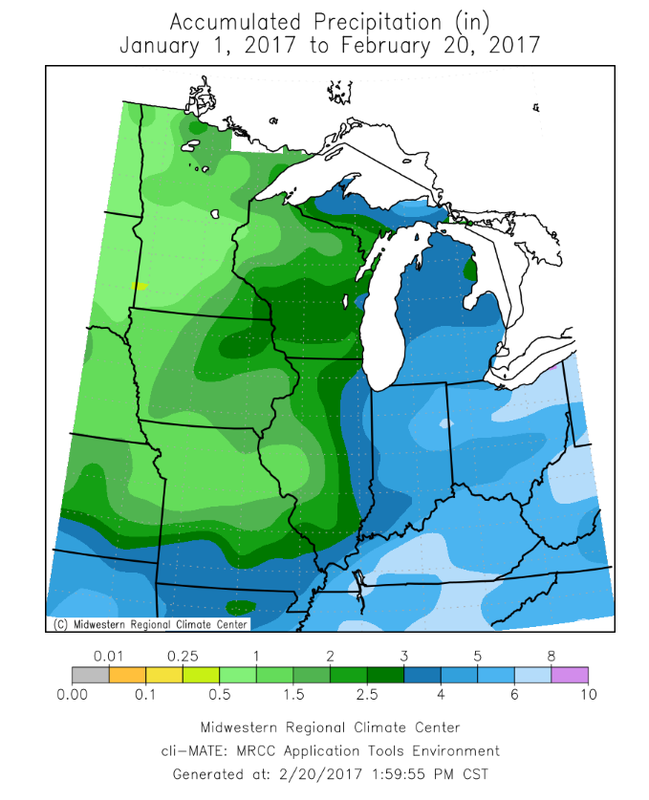 Unfortunately, to date, the Midwest has experienced less precipitation in 2017, when compared January through February 20th of 2012. The average temperatures from early in 2012 do look very, similar to those experienced thus far in 2017! Stay tuned for more updates.